TechRadar and PC Gamer are diving deep into virtual reality this month with a series of guides, how-tos, and features digging into every aspect of VR that we're simply calling VR Month. It's all being made possible by Oculus, which stepped up to support this month-long project. Thanks, Oculus! Virtual reality (VR) is an experience unlike any other – at least, that’s true to a degree. The ability to look around freely and interact with the virtual environment, especially with hand presence and six degrees of freedom, far exceeds the sense of inhabiting a space that you’d get from a traditional video game. Given that difference, you might naturally wonder how multiplayer works in VR. While the VR aspect and hand presence of it can make for some amusing and engaging differences, a lot about multiplayer in VR is similar to non-VR games. Let’s take a look at the various types of multiplayer games available in VR and see how they differ from their traditional, two-dimensional counterparts. Some VR games offer a multiplayer experience where one player jumps into the virtual world while other players operate outside. This can be done multiple ways, with cooperative and competitive modes possible, generally offering a novel gaming experience. The Oculus Go game Covert, and the multi-platform Keep Talking and Nobody Explodes, are good examples of hybrid cooperative games. One player is in VR, while another tries to aid and instruct the VR player. In the case of Covert, one player tries to guide the other through an elaborate heist. In Keep Talking and Nobody Explodes, non-VR players have instructions on how to defuse bombs, but only the player in VR can see and interact with the bomb. There are also asymmetric multiplayer games where one player in VR is up against non-VR players who have a totally different perspective. A number of titles in PlayStation VR’s The Playroom pit a VR player against up to four other players with controllers. Similarly, Mass Exodus has a VR player try to identify and capture rogue robots that are controlled by non-VR players as they try to blend in and shut down the facility they’re in. There are plenty of games that offer the type of multiplayer you’re used to, but they’ve replicated the experiences in VR. Some even bare an uncanny resemblance to popular titles. Pavlov VR looks and plays much like Counter-Strike. War Dust definitely has a Battlefield vibe going on with 32 versus 32 multiplayer battles. And, Stand Out: VR Battle Royale offers that Fortnite-like gameplay in VR. The difference here is that VR offers a new level of immersion, and free hand movement can give players freedom to do things they can’t in non-VR titles, like throw their gun on the ground and surrender with their hands raised to see if enemy players will show mercy. This control over your own movements is a big difference. Sometimes this can look buggy, but it opens the door for interesting interactions. A downside to the multiplayer VR experience comes from how players move in-game, though. Teleportation is a popular movement mechanic in VR, because it helps avoid motion sickness. But, it can be hard to shoot a teleporting target. So, some games use uncomfortable locomotion or weird hybrids. Other games keep players more or less stationary, as in the Pong-esque game Sparc, which reduces some of the freedom that makes multiplayer VR interesting. You’ll also find cooperative games that differ from non-VR games in a similar way to versus games. From Other Suns and Marvel Powers United VR bring players together in VR to tackle shared missions. The main difference between cooperative and competitive games is that it’s a little easier to offer cross-platform play with non-VR, since fairness isn’t an issue. The popular heist game Payday 2 lets VR and non-VR players team up, as does Star Trek: Bridge Crew. There’s no set path for what VR multiplayer needs to be. Plenty of games are bound to come out that follow the formulas we’ve seen in the games already mentioned, but wider industry adoption of VR and new technologies can lead to new types of experiences. Bethesda’s The Elder Scrolls Blades is planned to offer gaming experiences that extend from mobile all the way up to high-end VR. What’s more, the game will feature cross-play between platforms, so someone playing on an iPhone during their morning commute could, in theory, encounter another player fully kitted out for VR. Oculus has also shown another direction VR can go. 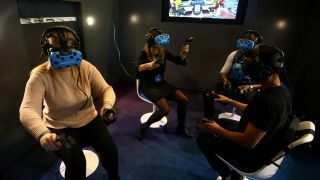 It showcased a multiplayer mode of Dead and Buried, a cowboy shootout-style game, in which multiple players were competing in a shared virtual space that was actually mapped to the real physical space they occupied. All of the players were playing wirelessly with the upcoming Oculus Quest. While plenty of games are likely to continue emulating popular non-VR titles, advances in limb tracking and tetherless VR capabilities may make the players we encounter in VR seem more and more like representations of that player, rather than some character that’s just controlled by a player. That is when things will start to get wild. Supported content on TechRadar means the article has been created in partnership with a developer, publisher, manufacturer or other relevant party. When you see this disclosure note in an article, it means that the article idea has been approved by another company – a developer, hardware maker, or publisher – but that otherwise the content is planned, written, and published by TechRadar without any further approval. This is distinct from sponsored content on TechRadar, which is created entirely by a third party, and not the TechRadar editorial team.